It is perhaps not too alarmist to compare the current stand off between the West and Russia to a period in history, which harkens back to the Berlin Wall (1961) or Cuban missile crisis of 1962. Here is a snippet for an exchange in Vienna over the Berlin Wall stand off and the city’s status, between the two cold war leaders. Can you imagine such talk today between the man in the White House and the Kremlin? But lets looks into maybe why the Russians are so miffed about Ukraine and why the US has fumbled the ball diplomatically so far, by issuing empty threats and ultimatum instead of really engaging Russia in serious discussions about ways to defuse the crisis. To understand what is at issue here, we need to back to the end of the cold war. If you know the directed in directions such left and right or east and west, then you’ll know what I am getting at here. After the cold war ended former Soviet leader Mikhail Gorbachev gave his go-ahead for the unification of Germany. He was however betrayed by the Western powers that assured him that a united Germany would not be incorporated into NATO. Germany joined in 1990, despite assurances from George W. Bush senior to the contrary. Then NATO did it again. In 1999, despite Moscow’s admonitions not to do so, NATO expanded to central Europe (Poland, Czech and republic and Hungary). Then came another wave of expansion in to an area, which in geopolitical terms makes up the inner or marginal ring which surrounds the “Heartland” deep inside Euro-Asia. The heart of course, this case is Russia itself. 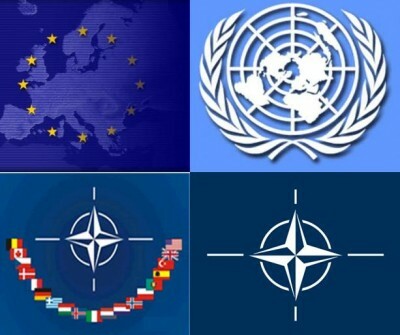 In a second wave of NATO’s further drift eastwards, the Atlantic alliance incorporated three former Soviet republics (Lithuania, Latvia and Estonia) as well as another central European state Slovakia and two Balkans states. This gave NATO members access to the Black sea (Bulgaria and Romania). Thus NATO managed to surround Russia from the Baltic to the Black sea. Do you see a pattern or a trend yet? Then last but not least in 2009, Albania and Croatia joined the NATO club. In other words, a hostile military alliance (in Moscow’s view) now had access and almost total control of the Adriatic coast as well. This is nothing more or less than classic policy designed by the brilliant strategic thinker and diplomat of his day, George F Keenan. Keenan, who was also the father of a policy called “containment”. This is a very key word. We are seeing today a revival of this containment policy, which was designed to curb Soviet, might throughout the cold war. In addition to containment there is a conscious intent by Brussels (NATO HQ) and Washington to strangle Russia, by cutting it completely off from sea and land access beyond its borders or for its fleet and military supplies to remain mobile. It needs to be mentioned at in the last years of his life Kennan was absolutely opposed to NATO expansion, and warned such a policy would do grievous harm to East-West relations. Which it did. But may I stress this: we are no longer living in the Cold War as some policy wonks or Rip van Winkles in Washington might think. Russia today like America is pivoting to the east and looking for ways to counterbalance NATO by means of the Shanghai Cooperation Organisation (which comprises Russia, China, Kyrgyzstan, Uzbekistan, Tajikistan and Kazakhstan) . This club is effectively almost the Eurasian equalvent of NATO. Russia does not want to badger the west on its Western or central European flank any longer unless it is provoked to do so. Witness in addition to the drive of NATO east, the stalled plans to install a missile base and radar network in Russia’s NATO neighbours, which Washington now wishes to ramp up again. Russia really wants to go east. It has no designs on former East Bloc states, which are all now, NATO members but the west wants to bait the country into a confrontation on its western flank. The current crisis in Ukraine has made it plainly evident the West and by extension NATO wants to continue its eastward push or incursion into Russia’s front lawn and the same time try to scuttle all attempts by Moscow to create the formation of an alternative strategic, economic and yes military alliance to NATO. This is what’s its all about in my view; and the stakes are high almost as high as they where when Kennedy and Khrushchev played hardball politics and with the world as their baseball. Just like Obama and Putin are doing today. Let’s hope neither drops the ball this time.